The Natural History Museum in London has many great exhibits but none so famous as the giant Blue Whale model in the mammals hall. This page will walk you through the hall and show you both videos and still pictures of some of the exhibits. 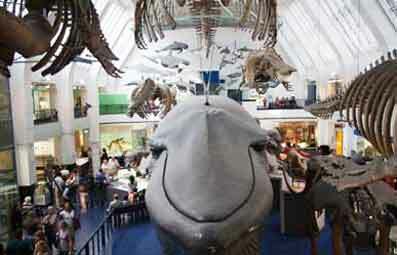 The Natural History Museum cannot be visited without a trip to the Wale room. 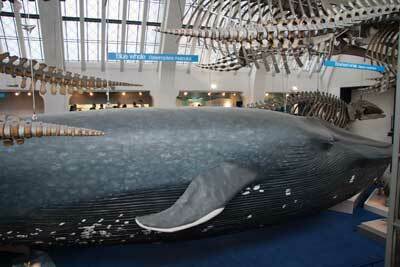 Here you will find a 28.3 meter long model of a Blue Whale made from wood and plaster. It was made in 1938 before Whales were seen underwater and before it was realized that they are actually much sleeker and streamlined than the model depicts. This first video shows you the whole length of the life sized Blue Whale model which spans the whole room. 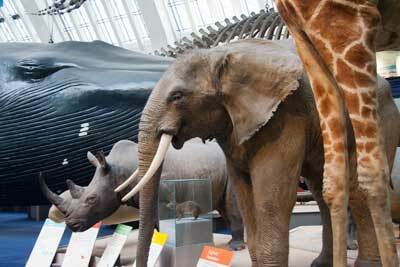 You will also see along the right side of the hall where there are other mammal giants such as the elephant, giraffes and Deer. 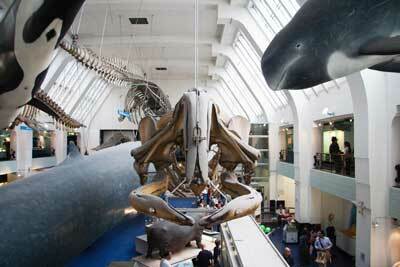 The Skeleton of a whale is hung above the model; it really does have the wow factor. The hall is on two levels which enables you to really get a great look close up of the giant skeletons which hang from the ceiling. 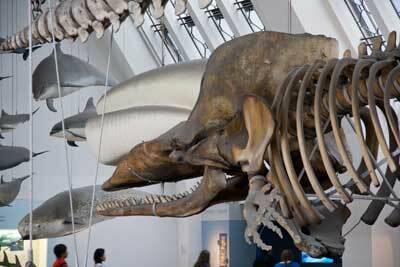 You also get a great look at the Blue Whale model from every angle. I like this view, right into the face of the whale, a view I have known since i was a child. This picture is taken from the other end of the galley. It can be hard to believe that you are really looking at a real skeleton of a real animal. That's what is so great about this gallery, it really makes you stop and think. This second video shows the room from the left side of the Blue Whale. 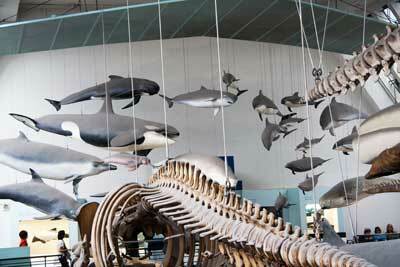 You will see the amazing Models of various porpoise’s and also some fantastic life-sized Elephants. All around the walls of the galley are videos and interactive exhibits which teach you about how a whale lives and also how they are in danger from both humans and the changing climates. There are always a lot of people in this Natural History Museum gallery and so you will have to be prepared to spend some time here to get to see all the exhibits, but it is well worth it. Children love this gallery and you can hear the cries of joy and excitement everywhere. The atmosphere in this gallery is electric and you can easily spend an hour in this one part of the museum alone.